Tamanu Beach Resort – Flights to Aitutaki, Cook Islands. Rarotonga International Airport is the gateway to the Cook Islands. Visitors can fly domestically with Air Rarotonga to the island paradise of Aitutaki. Travel to Aitutaki- just a short plane trip (approximately 45 minutes) from Rarotonga. The Cook Island's domestic airline ‘ Air Rarotonga’ will bring you to our friendly island, where you will be welcomed with typical Aitutaki hospitality, a flower 'ei' (necklace) and plenty of genuine smiles. 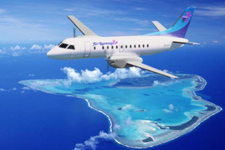 Air Rarotonga operates regular flights seven days a week. Please click here to book online with Air Rarotonga.